Perfect fall running weather greeted those who trudged-up the paved Mountain Highway just before 7:30. As we milled about the start line waiting for stragglers, several starters claimed Club points for collecting trash. This made me wonder... if all trash collected by CFA members at CFA events was placed end-to-end, how long would the row of trash be? This was probably the last CFA run longstanding Club member and host of the North Shore Enduro, Andy Nicol, would participate in for a while. We joked about how small the hills were in Florida. Andy countered that St. Augustine gets a lot of sunshine, so at least for those who don't like running in the rain, there's a lot more running to be done. I dedicated today's run to Andy. Runners quickly broke into 3 groups: the fast boys from over town, those out for a good workout, and those who wished they were still in bed. After participating in the GranFondo Whistler the day before and helping some nutty friends with an aid station around midnight, I definitely felt I could have slept in. However, I was reminded of the "no whining rule" so I dug deep and tried to keep up with Jeff, a newbie out for a first run on Mountain Highway. Time passed quickly as Jeff and Robert debated what was the best marathon for getting a Boston qualifying time. Was it the new and improved Vancouver International Marathon? Victoria? Kelowna? Maybe Portland? Maybe it wasn't the profile of the marathon that had to change for a faster time, maybe it was the training that went in beforehand? 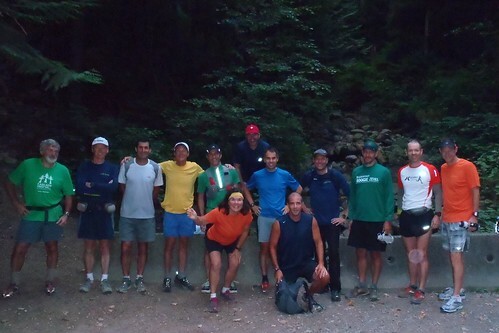 This lead us to an analysis of training on the roads vs. trails and why the particular route that we were running on this morning was one of the best training venues in the lower mainland for long distance runners. Here's what we came up with: wide dirt and gravel road, consistent grade that is not too steep, clean air, safe, can't get lost, peaceful, works the VO2 max on the uphill, tenderizes the quads on the downhill. Also, it's nice to see faster and slower runners in the same event. Dave Cressman was on fire when he passed us going downhill. What's he on? For a tired old guy, Andy Nicol looked great only a few paces behind Dave, and Paps and Barry were within striking distance of Andy. Would a new world record for the fastest lap at Mountain Highway Madness be set today? We didn't see Marc at the turnaround. He decided to continue running uphill to the top of Fromme Mountain. "This is a lot easier going down", noted Jeff the newbie, after we touched the "turnaround rock" and headed back to the start. Too bad Karl or John didn't catch us going down. It turns out Jeff is a beer connoisseur. They would have enjoyed the discussion about barley wine, IPAs and stouts that pair best with cheesecake. Apart from exchanging high-5s with John, Paul and Rochelle along the way, our little pace group was barely conscious of the downhill leg. Funny how time flies when one finds a topic that everyone in the group is passionate about! Given none of the runners out today was interested in doing more than 2 laps, we moved the finisher get-together forward over an hour and, instead of a beer and a burger, had a coffee and cinnamon roll. Thanks to Trailrunner Magazine, we awarded a subscription to the popular running magazine to newbie Jeff before wrapping up our little get-to-gether. No new speed records were set this morning. Congrats on bagging another peak, Marc. Thanks for the push, Robert and Jeff. Bon voyage, Andy... 'hope to run with you in Florida one day soon. Congrats on getting out of bed to all who participated in the run this morning... I hope you had a great time in the north shore woods!